In small bowl, pour water over bulgur. Let stand 30 minutes. Meanwhile, in large bowl, mix remaining ingredients except tomatoes. Core tomatoes. Make 4 cuts in each tomato from top to bottom without cutting all the way through bottom of tomato. Place tomatoes on individual plates. Stir bulgur into bean mixture; spoon into tomatoes. Use your prettiest ripe tomatoes for this salad. The tomatoes serve as an edible salad holder, and having them at peak ripeness makes them easy to eat with the salad. This salad can be made ahead, even the day before if you like! 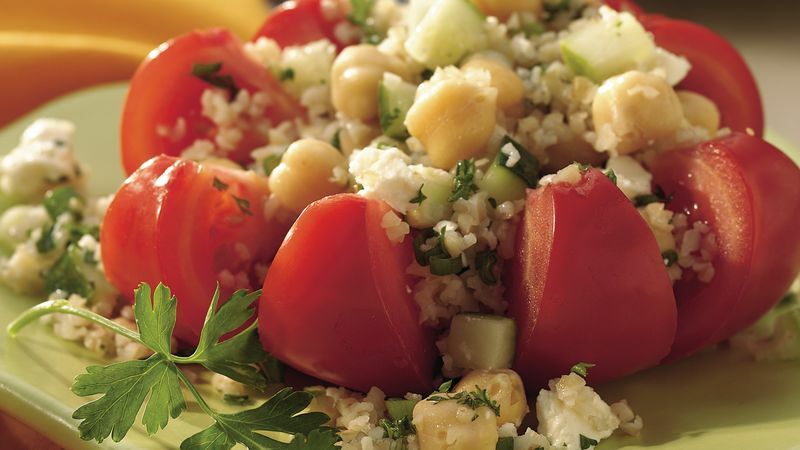 The bulgur will continue to absorb the lemony dressing, so you may want to stir in a little olive oil to moisten it before serving. Feta cheese is a salty Greek cheese that has a tangy flavor. Look for flavored feta cheeses as well.